Also disappointed are the many scientists who expected a more impressive display from Elenin. That expectation seemed well founded based on the growing coma of Elenin in the months following its discovery in December, 2010. And prior space probes sent to comets helped to feed an illusion about the comet’s size. The estimates appear to have missed the mark completely. Strangely, the popular scientific media, insofar as they’ve shown any interest in Elenin, are satisfied to simply expose the lunacy of Internet fear-mongering. But is that really all we should be discussing here? Elenin has only one connection to “Doomsday.” Like every comet, it reminds us of ancient memories of a truly terrifying and destructive Great Comet, the true source of comet fears and Doomsday anxiety—a verifiable cultural conditioning that has persisted for thousands of years. With every appearance of a comet the ancient fear resurfaces, but this fact adds nothing to scientific discussion of Elenin and its fate. The little wisp of a comet has no relationship to ancient Babylonian references to “Nibiru,” a subject misrepresented up to a cosmic level by the originator of a Nibiru doomsday fantasy—Zecharia Sitchin. From the beginning, the Nibiru concept promoted by Sitchin was a meaningless fiction. A few meager examples of the word exist in Babylonian literature. 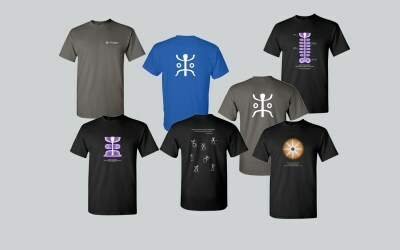 Nothing in the language suggests either a comet or the rogue planet claimed by Sitchin. Of course the spokesmen for “good science,” a phrase that too often means official dogma, delight in mocking Doomsday musings. But that response can only distract from what should be discussed—the failure of standard comet theory to describe or predict comet behavior over the past 25 years. The ignored fact is that Elenin has only added to the list of comet “misbehavior”—throwing a spotlight once again on mistaken theoretical assumptions. 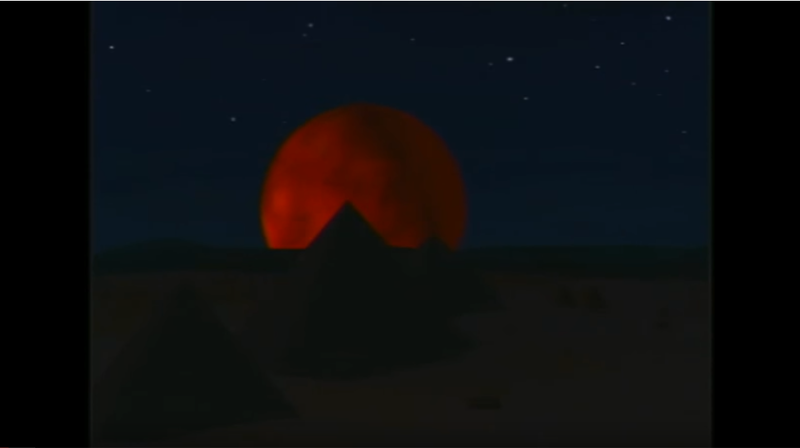 Just when theory said the comet should have exhibited its greatest activity, it almost disappeared. One would assume from the media silence that the comet’s denouement poses no mystery to science. But to those who have come to understand the electrical nature of comets, there is something particularly noteworthy in the fading of Elenin. It is now clear that the original guesses about Elenin’s mass were overstated to a spectacular degree. It will certainly not serve the interests of scientific progress to ignore the question posed or turn away from an essential reconsideration of theory. This opinion was formulated as the comet approached the asteroid belt in its rapid fall toward the Sun. 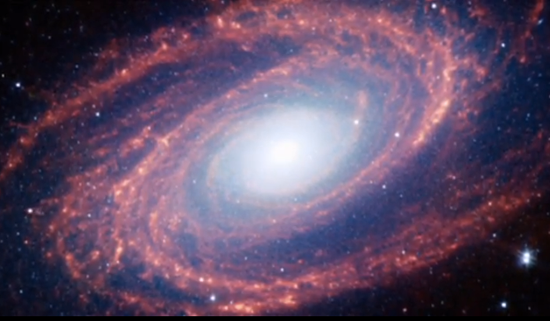 Astronomers observed that Elenin was brightening faster than expected. Between April and August, the dusty coma grew from 80,000 km in diameter to 200,000 km. Applying standard reasoning, observers agreed that Elenin, which seemed rather weak when discovered, was a “typical”-sized comet. 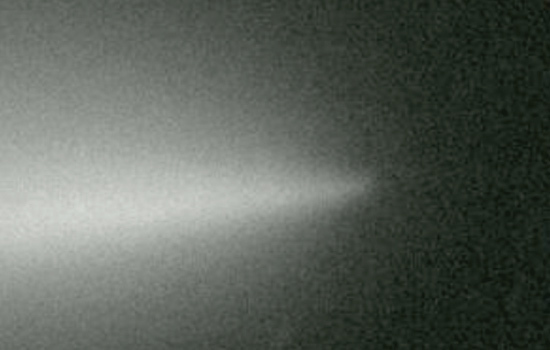 Ian Musgrave writes, “Shortly after the coronal mass ejection the comet flared up and you could see some beautiful details in the tail, with the tail was twisting about in the solar wind.” But over the next few days observers reported a huge decrease in the intensity of the comet, and it appeared that the comet was falling apart. It seems that charged particles from the Sun did what the Sun’s heat couldn’t do. But did the specialists see a clue in this electrical event? 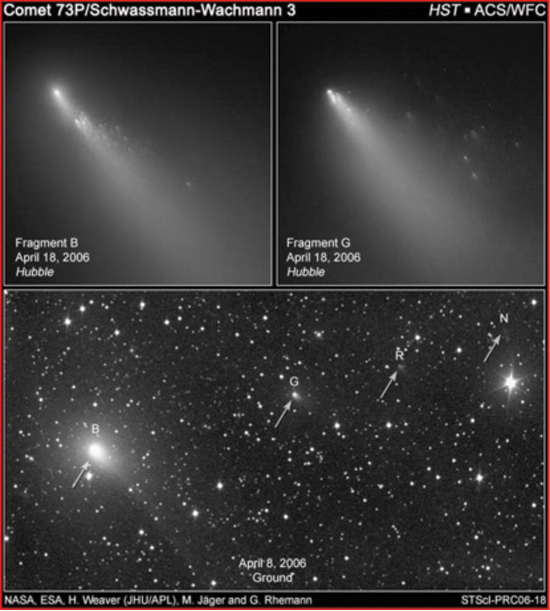 Did anyone remember how, in October 2007, comet Holmes began discharging explosively, brightening by a factor of a million after it was subjected to a huge spike in the solar wind, eventually producing a spectacular coma larger than the diameter of the Sun. The event occurred as Holmes moved away from the Sun, leaving stunned astronomers to offer wild guesses about the cause. No mention of any connection to the surge of charged particles from the Sun, since electrical causes are so clearly outside the astronomers’ field of view. 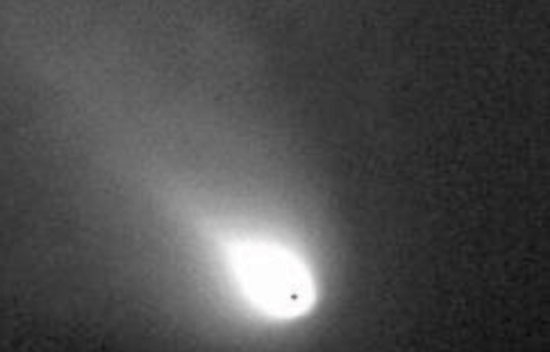 Comet Holmes on November 4, 2007, showing the blue ion tail on the right,taken from Hungary. CREDIT: Ivan Eder. Least of all did the the scientific media recall how, in 1991, comet Halley flared up to 300 times its normal brightness while on its long journey away from the Sun, in the distant realm between the orbits of Saturn and Uranus. Here, a surface temperature of -200 ˚C would categorically exclude all “cometary” activity” under standard assumptions. Was it a coincidence that this occurred in the wake of near-record solar outbursts? As for Elenin, there’s apparently little or nothing left of the puny object. We’ll know shortly when it, or its residue, emerges from behind the Sun. But consider the implications of Elenin’s fate. If astronomers are correct in viewing comets as chunks of icy material moving through an electrically neutral domain of the Sun, imagine the absurdity of thinking that “warming” from the Sun—starting in the icy region beyond the asteroid belt!—could have caused Elenin to evaporate completely within a few months later, while only spending a few weeks inside Earth’s orbit. This is the one issue on which the standard model and the electric model deliver the same message: Elenin’s size was greatly overestimated. 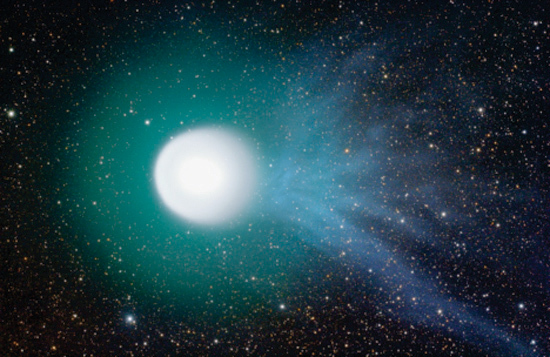 The answer—apparently the only plausible answer—is given by the electric comet model. In electrical terms, when a comet drifts in from the outermost regions of the solar system, it is not reasonable to base size estimates on observation of comets with much shorter, less elliptical orbits. Some comets we can visit because they have short periods and we know where they are. But when seen electrically these comets cannot give us an accurate picture of comets as a whole. Electric comets imply that the Sun is the center of an electric field. It is the most positively charged body in the solar system. A comet approaching the Sun from a much more distant region will carry far more negative charge than those orbiting closer to the Sun. And this is why comparisons based on size or strength of cometary activity alone, without reference to orbital characteristics, have never held up and never will. The negatively charged comet nucleus of Elenin, arriving from the most remote regions of the Sun’s influence, was very likely just a small rock, perhaps a hundred meters or less. Moving through the Sun’s radial electric field, it began discharging under the electrical stress from rapid entry into a more positively charged environment. As electric arcs to the surface excavated material, accelerating it into a highly diffuse dust cloud, Elenin began to display a coma. That, not any imagined “thermal effects,” was why Leonid Elenin detected the tiny comet in December 2010, when it was well beyond the asteroid belt. Then, on August 19, when the comet was much closer to the Sun, it was struck by the proton-bearing cloud of a CME. Electrical breakdown occurred and the nucleus shattered like an exploding capacitor—just as we’ve seen in the case of other “inexplicable,” exploding comets. A “3 or 4 km-wide” chunk of ice and dirt could not just disappear at Elenin’s distances from the Sun, even with disintegration. Elenin is not a “sun grazer.” Its perihelion (closest approach to the Sun) was outside the orbit of Mercury. But what if Elenin was, in truth, a tiny comet, but a strongly charged body for its size? As noted above, since Elenin arrived from a very remote region, electrically-provoked brightening would be expected as it entered a more positively charged region of the heliosphere. For the same reasons, under the impact of a CME, disintegration by electrical breakdown is the obvious interpretation of what occurred. 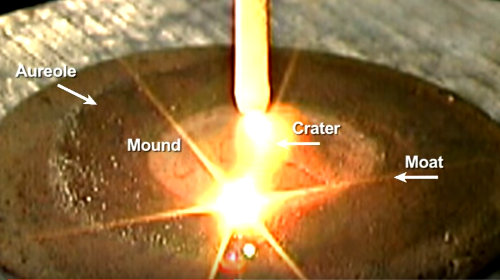 Would a larger comet have disintegrated so completely following the electrical explosion? For comparison purposes, the progressive disintegration of the unpredictable Comet Schwassmann-Wachmann 3 is worth noting. In the image above, the Hubble Space Telescope captured the disintegration of Schwassmann-Wachmann 3 in progress, when it was still out beyond Earth’s orbit. 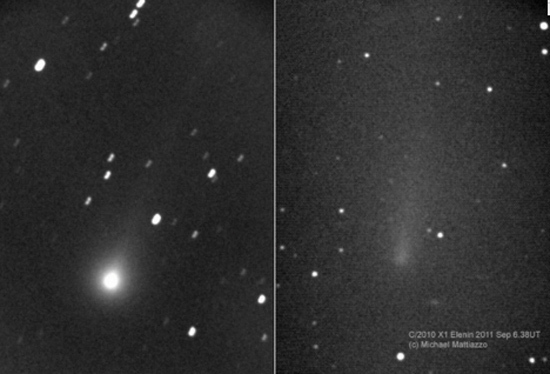 Apparently, in this case a comet of more “respectable” size than Elenin exploded into fragments through phases, in the course of two or three orbits, leading to sudden, rapid disintegration of at least two larger fragments in April, 2006. 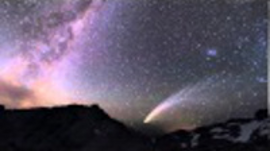 It seems that when a comet of a more “typical” size disintegrates, it puts on a more lasting and spectacular display. The prolonged disintegration of Comet Schwassman-Wachmann simply underscores the point noted above, that Elenin’s disintegration in a bright flash, followed by rapid disappearance of the residue, is the confirmation of a tiny nucleus. 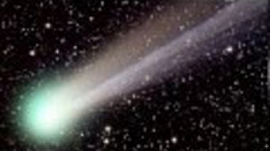 A 21st century illustration of this point was the disintegration and disappearance of Comet Linear in 2000. Indeed, Linear’s entry into the inner solar system from the outermost regions, its highly eccentric orbit, its brightening, and its demise appear to have anticipated very well the story of Elenin. Compare the two images below to the “before and after” images of Elenin given earlier in this article. For more than a quarter century now, on every major issue confronting comet science, the record is remarkably clear. No “standard” model has withstood the surprises of the space age. When Donald Brownlee, head of NASA’s stardust mission, confessed, “It’s a mystery to me how comets work at all,” he was simply speaking with the candor that all comet specialists owe to the tax-paying public. Today, in the face of growing public disinterest, this candor is needed more than ever. 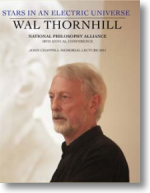 Wallace Thornhill’s outstanding lecture at the NPA 2011 Conference is now available on DVD! This is not just an excellent science lecture, it ranks as one of the most important indictments of current dogma ever delivered, with extensive ramifications for the entire field of physics. Thornhill’s message to conventional theorists is simple and direct: give up all mathematical contrivances and return to the solid ground of observation, deduction, and interdisciplinary synthesis. Based on more than four decades of systematic research, Thornhill’s exposition offers a practical way forward in the sciences, with a broad understanding of discoveries in the laboratory and in space. A physicist and natural philosopher, Thornill stands on the shoulders of Kristian Birkeland, Hannes Alfven, CER Bruce, Ralph Juergens. Donald Scott, and others. In this John Chappell memorial lecture, he sets forth a unified paradigm where plasma is the dominant, universal medium and the electric force rules the cosmos. CME, comet Elenin, Comet Halley, Comet Holmes, Comet Linear, doomsday, electric comet, exploding capacitor, Great Comet, Nibiru, Planet X. Bookmark.